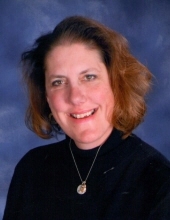 Laura Lee Retschulte, 46, passed away Monday November 12, 2018 at KU Medical Center. The Funeral Mass will be 11:00 AM Saturday November 17, 2018 at Holy Family Catholic Church, with a visitation from 10-11 AM. In lieu of flowers contributions are suggested to Holy Family Catholic Church. Laura was preceded in death by her father, John Retschulte. She is survived by her mother, Mary Jo Retschulte, of the home; daughter, Katie Jo Retschulte, Dallas, TX; siblings, Teri (Dan) Lightle, Bolckow, MO, Susan (Jeffrey) Jones, Plano, TX, and John Jeffrey Retschulte, Kansas City, MO; nieces and nephews, Nathan and Steven Lighte, and Sarah and Jenni Jones. Please help celebrate the life of Laura by sharing a memory or expressing your condolences to the family. To send flowers or a remembrance gift to the family of Laura Lee Retschulte, please visit our Tribute Store. "Email Address" would like to share the life celebration of Laura Lee Retschulte. Click on the "link" to go to share a favorite memory or leave a condolence message for the family.